Turkish Beach Soccer National Team, coached by Emrah Aykurt, beat Estonia 4-2 in Europe Beach Soccer League B Super Finals and won the championship title of League B. After these result, Turkish Beach Soccer National Team have promoted to Europe Beach Soccer League A for the next season. Turkish Beach Soccer National had qualified to Europe Beach Soccer League B Super Finals by finishing their group ahead of Moldova and Kazakhstan. In Europe Beach Soccer League B Super Finals, Turkey had finished Group 2 as winner, by beating England 4-2, Hungary 6-4 and Moldova 3-2. 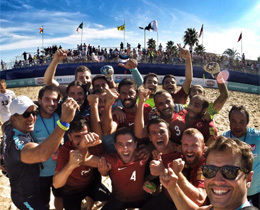 Turkey had scored 17 goals in 4 matches during Europe Beach Soccer League B Super Finals. 6 goals came from Cem Keskin while Yasin Bağcı hit the target for 4 times. Volkan Yeşilırmak had scored 2 goals while, Barış Terzioğlu, Seyit Ahmet Süer, Semih Türkmen, Erkan Akbal and Erkan Anzaflıoğlu hit the target for 1 time.